The Harden Foundation restored the rare Challenge Double Header Wind Engine and historic mill buildings located on the Harden Estate in Salinas, California. The Challenge Double Header Wind Engine, built in 1892 for Duncan McKinnon, is a masterpiece of Victorian engineering—a mighty windmill that supplied power to operate millstones, a grain elevator, water pump, and a woodworking shop. It is extremely rare and the only known surviving windmill of its kind. The Harden Foundation seeks to memorialize the rich history of the Harden Estate through historical projects that give back to the community while paying tribute to the past. The first, the restoration of the Challenge Double Header Wind Engine and historic farm buildings, is expected to be completed by the end of 2008. The restoration project began in April 2003 when the Harden Foundation hired a famous millwright, Derek Ogden, to report on the condition of the mill site on the Harden Estate. In December of 2003, the Foundation’s Board of Directors approved the project and an advisory committee was formed. Over the last two years, the wind engine and mill have undergone impressive documentation and restoration. Prior to restoration, Wayne Ragen with Salinas-based Belli Architectural Group, meticulously documented the content and layout of the historic buildings, creating a blueprint on which to base the restoration. Belli Architectural Group worked with Dilbeck & Sons Construction to plot how each aspect of the structure would be brought up to current building codes. In September 2004, the wind engine was removed from the tower on top of the Harden Ranch mill building and transported to Shickel Corporation in Bridgewater, Virginia. Ted Herman supervised the fabrication of 380 aluminum blades for each wheel, using a total of 40,000 rivets to reassemble the wind engine. The blades match the weight of the original wooden blades, but are constructed from aluminum to prohibit water absorption and provide greater strength and durability. In August 2005, Ben Hassett, a millwright from Richmond, Virginia, began preparing machinery in the mill to once again connect with and be powered by the wind engine. Hassett began by disassembling the workings of the mill and moving machinery out to make way for the structural work. He then began intensive conservation work on all the machinery, taking everything apart piece by piece, and researching every item to inform the restoration. Information was difficult to find, since much of the machinery was one-of-a-kind. Hassett cleaned and repaired wooden pulleys, line shafts, bearings, drives for the different machinery, and a rare Joseph Wagner barley mill. He also investigated and researched the layout of the woodworking shop next to the mill, and discovered that much of the mill machinery had been built by hand by the original owner, Duncan McKinnon, in his woodworking shop a century ago. Also in the fall of 2005, Jay Ralston and his team from Dilbeck & Sons Construction began retrofitting the mill. They used a chainsaw to remove a crumbling wooden tower that formerly supported the wind engine. Next they needed to reinforce the floor of the mill and main tower foundation by drilling thirty-foot deep holes and pouring 55 yards of concrete. They carefully laid a ring beam around a central brick cistern that is older than the mill itself. After the concrete they installed structural steel. Ralston's team kept the building's original rock and mortar foundation but reinforced it with stainless steel rods and poured concrete around it. The talented construction team will also be retrofitting a nearby woodworking shop, bunkhouse, and blacksmith shop—the very shop that once manufactured bolts used in both the original and rehabilitated mill. In April 2006 four massive tower beams were put into place to support the wind engine and drive shaft, and then stained to match the old wood. In early June 2006, the wind engine was taken apart again and sent via two flatbed trailers back to California. The Shickel Corporation team traveled to Salinas and rebuilt and re-installed the five ton wind engine with the help of a specialty crane company. After 100 years, the historic and extremely rare windmill was operating once again on June 7, 2006. The Challenge Double Header Wind Engine is the last surviving wind engine of its kind that we know of. Its unusual "double header" design means that it has two 30-foot wind wheels which rotate in opposite directions. In addition, two smaller side wheels rotate and cause the wind engine to face the direction of the wind. The wind engine will be operated on special occasions to allow school groups and the community to learn about the operation of the mill, the agricultural history of the Salinas Valley, and the legacy and special contributions of the Harden family. Ultimately school and community groups will be able to witness first-hand the workings of a turn-of-the-century mill. 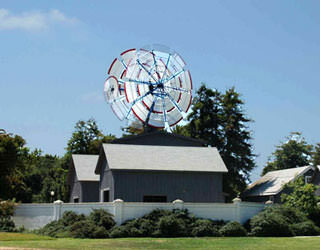 The Harden Foundation was selected as one of the recipients of the 2007 Preservation Design Awards for the work on the Challenge Double Header Wind-Engine located on the Harden Estate. The awards program is presented by The California Preservation Foundation. The California Preservation Foundation, founded in 1976, is California’s only statewide non-profit historic preservation education, advocacy and membership organization. You can go to their website at: www.californiapreservation.org for more information about the organization and their programs and events. The California Preservation Foundation recognizes the best in historic preservation projects through its annual Preservation Design Awards. The 24th annual Preservation Design Awards was held on Saturday, September 15, 2007 at the Westin St. Francis in San Francisco. The Harden Foundation was honored to receive this distinguished award.